Seen Any Cute Baskets Lately? Eleanor is starting to accumulate a lot of toys, and with Christmas coming she’ll be getting more. Since our home doesn’t have a family room or den, we spend most of our time together in the living room and we keep some toys there. I’ve been looking for a couple of baskets to fit under the side tables for storage, but I haven’t had much luck. I keep stupidly bringing baskets home that don’t actually fit… See, I hadn’t actually measured the openings until today. That might have helped, eh? So far I’ve tried the LIDAN basket from IKEA, and the Underbed Storage basket from west elm. The IKEA basket was too tall so we’re using it as a toy bin next to a chair in the living room. I like that it collapses and sort of looks like it was knitted, but Brandon thinks it look old ladyish. He hates it! The west elm basket is really nice (and I think Brandon likes it), but it’s too wide. I stuck one under the coffee table for now, but I can’t decide if it looks OK under there or if I should just return it. I need something no bigger than 13.5″W x 10″H x 24″D, and not too country/casual. Any suggestions? I recently bought some great baskets from CB2, but they were on clearance and no longer there. These are similar and nice (but mine are black). Target always has lots of different baskets. I think I hard leather box-type one would look nice in your living room. Ooh, creamy white leather (or faux) would be nice. I didn’t see any at Target right now though. Michael’s (at least the one I go to) has a huge selection of baskets. They have a lot of gingham-lined ones, but you could probably take out the country-kitsch fabric and put in your own or just leave it without. Try Crate and Barrel. They have some nice options. 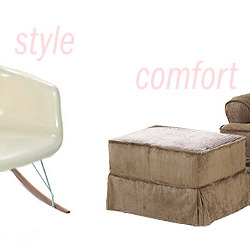 we are ALSO hunting for a basket to fit in the irregular-sized nook in our living room, for the exact same purpose. i will be watching this thread! I would go with the Ikea ones because they are inexpensive. Kids are hard on things, so it is easy to replace. This is one thing I learned from working at daycares. With kids, they get bored with their toys very quickly. I use to put some toys away in storage bins. After six months, I would put the toys that were out in bins and bring back out the other ones. Helps with the clutter and keeps them interested. I bought these to use as toy bins for our nursery and unfortunately, I think they’re too tall for your purposes. However, they’re AMAZING (totally indestructible — seriously, unless you cut them with a knife and/or try to set fire to them): http://www.landofnod.com/family.aspx?c=106&f=4111. Plus, the price point is pretty good — I got both brown and green so they work in the kiddo’s room as well as in other areas of our house. Land of Nod does, however, have a lot of options. This one came to mind, too: http://www.landofnod.com/family.aspx?c=106&f=5048. Maybe take a look at their website? Yes, we have those tall bins in Eleanor’s nursery and we love them! i use these from the container store. the small ones tuck really nicely into our book case. Oh, those might work! The size is great. I am also looking for some baskets with lids on them for toy control. Love the ones you show from Ikea. We also use the big metal buckets/tubs for toys – the ones that we used to use for adult beverages at parties!!! I will keep tabs on this thread. Thanks. well, the price is not right, but these seem like they would work for you. maybe these from target, much better price…. We got ours at Target, the Orla Kiely sets, they are perfect and sturdy for shelves. I have a few of these baskets from CB2. Although I have them in a darker color (not sure if they still make the darker one). I like them a lot and use them for storing blankets. DUDE. I forgot about these! Do you have a Home Goods in your area? They always have great items! Love that store! Winners sometimes has these sort of leather covered boxes in the housewares section… I think they’re meant for a home office actually, but they could totally work as a toy bin. I am a long time reader, infrequent commenter. But is there a 10 Thousand Villages anywhere near you guys? I get all my storage baskets at one of their retail stores (Just Creations) a few block from my house. They have a great selection (more than is available on their web page), are reasonably priced, and are fair trade. A physical store is nice because they sell those nesting baskets in the Just Creations too, but they split the three of them up. So instead of 44$ for 3 it they are priced $16, $14.5, and $13.5. The store also has some GORGEOUS jewelry. I always find what I need at The Container Store. Hopefully you have one in your area. Great containers of all kinds!! 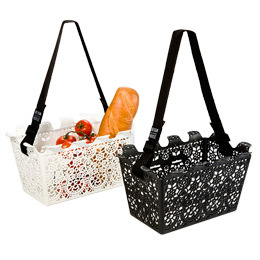 I bought one of the lace shopping baskets there and use it as a file basket on my desk. Love it! I love the Itso fabric baskets from Target. They come in all colors and sizes. I have them in chocolate brown and lime green and use them for dvd storage. Go to the Targe’ websit and search under “itso bin”. Good luck! Also, if you have a HomeGoods store in your area, they have a huge selection of storage containers. Target had some banana leaf baskets in various sizes recently. Dark and light too. I just picked up 4 of the light ones in two different sizes- each under $20. They have large and small sizes. And come in pink & brown! Perfect for you! What about those acrylic IKEA boxes made to use as drawers with the shelving systems? I have had good luck with baskets at both Crate and Barrel and World Market (or Cost Plus, whatever they are calling themselves nowadays). I like the banana leaf baskets at Target, they run around $15. I’ve had 3 I’ve been using with kids for almost 5 years now, they hold up great! Places like TJMaxx and Marshalls always seem to be where I find baskets and things like this. Even when I need something that’s not a standard size, they always seem to have the perfect thing, even though don’t keep a consistent stock. You should have them up there – we had both in Peoria. I’ve also been on the constant search for baskets to keep my 11 month old’s toys in and so far have yet to find the perfect solution. Right now we are using a variety of ( and these which are great but now that our baby is walking she often stumbles and hits the corners or, even better, she has learned to flip them over and stand on top of them. I think these felt woven baskets would be ideal, but only at a much more affordable price. How about Pier 1? I’m surprised no one mentioned that yet. I have had baskets from IKEA, Container Store, Target and Pottery Barn. But now I have fallen in love with the Land of Nod roper baskets. Lovely muted colors, good size and environmentally friendly. I will have them all over the house soon. And the service from them is fabulous – fast shipping and efficient. When my daughter was a toddler I bought a bunch of beautiful wicker baskets to put her toys in. Within a week, she had destroyed them. How? She dumped them out, turned them over, and stood on them, busting out the bottoms. I replaced them with those folding cloth bins, but that was a mistake, too. The metal rods which made the framing started to protrude through the fabric, and soon there were these dangerous, sharp projectiles at all the corners. Ugly as they were, I finally got clear plastic tubs to see us through the toddler and preschool years. 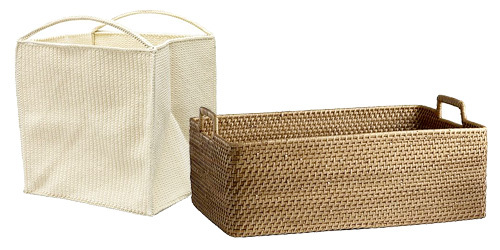 Another alternative is braided cloth baskets (think braided rugs). You could even make them yourself, talented as you are! HomeGoods is where I find awesome baskets for great prices, but of course it’s hit or miss as the selection always varies. But the hits are usually spectacular! We have also had a problem with our toddler destroying baskets (from Target.) I’ve started using a vintage suitcase, that was my grandmother’s. It is pretty to looks at, and super sturdy. We also have a vintage doll crib and doll house (mid-century modern) in the living room. They are fun to play with, and are a great place to store toys at the end of the day. Can’t wait to see what you get! Your finds are always rad. not sure if they’d fit under the tables. my other suggestion: check TJMaxx if you have one near you. I always find random boxes at homegoods or tjmaxx. Hobby Lobby also has their decorative boxes on sale right now (50% off). I didn’t read all of the responses, but i happened to stop into a Pier 1 yesterday and saw some fun ones. Have you looked there yet? I recently replaced our toy baskets in the family room with one from Steele Canvas http://www.steelecanvas.com/. They look really great and have a fun modern edge. Not only do they looks great but if you buy fair trade its also philanthropic! Otherwise Target and Cost Plus World Market both have really excellent basket selections usually. These have all been really good ideas. One other place to check might be Big Lots or Odd Lots and places like TJMaxx or Marshalls. They often have a lot of variety with reasonable prices. Cost Plus has a huge variety of baskets for good prices. I used crate and barrel baskets for smaller items (such as the little people collection we’ve amassed) but the skip hop collapsible toy catch alls have been great for larger items. They also fit in the expedit shelves and slide easily in and out of the bottom shelves. We lined our bottom four shelves with them and used woven baskets on the upper shelves. Hobby Lobby has some fantastic ones….and the last time I was there they were 50% off! We use plastic beverage bins from Target. They are easy to clean, have no sharp edges and can stack when not in use or even if they are not all the way full. I am not sure if they are the right size for that paticular space, but they are also wonderful for dragging toys from inside out to the yard or porch.